Hortiboletus rubellus, the Ruby Bolete, is a very pretty little mushroom, and usually it fruits in groups or rows rather than singly. It is frequently found on woodland edges, in clearings and in low-neutrient grassland in parks and gardens beneath deciduous trees, particularly oaks. Occasional in southern Britain but rare or absent in the north, Hortiboletus rubellus usually appears in groups of typically 3 to 10. 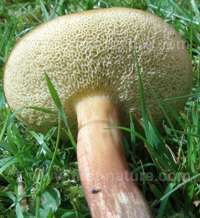 Synonyms of Hortiboletus rubellus include Boletus rubellus Krombh, Xerocomellus rubellus (Krombh.) Šutara, Boletus sanguineus With., Boletus versicolor Rostk., Xerocomus rubellus (Krombh.) Quél., and Xerocomus versicolor (Rostk.) E.-J. Gilbert. Hortiboletus rubellus is the type species of the new genus Hortiboletus. 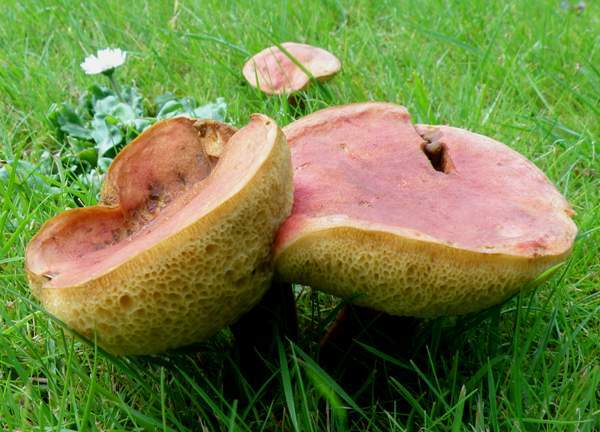 The old generic name Boletus comes ​​from the Greek bolos, meaning 'lump of clay', while in the new genus name the prefix Horti- comes from the Latin noun Hortus, meaning 'garden'; this is a reference to one of the main habitats in which this bolete is commonly found. The specific epithet rubellus is also Latin and means 'reddish'. 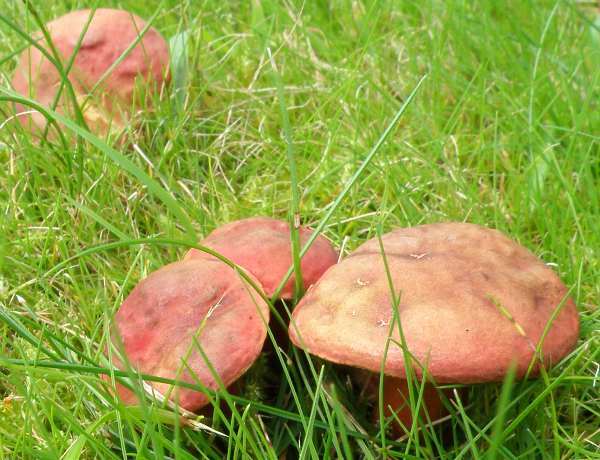 Ruby Bolete caps range from 3 to 8cm across, broadly convex and then flattening, occasionally with a slight central depression; scarlet red at first, fading to an olivaceous red at maturity and usually with a yellowish marginal band; surface dry and velvety, rarely cracking even when old. 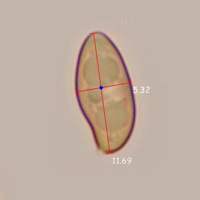 The cap cuticle is a palisadoderm of heavily incrusted hyphae. The tubes are dull yellow and terminate in lemon-yellow pores that become greenish with age. When bruised, the pores and tubes slowly turn blue. 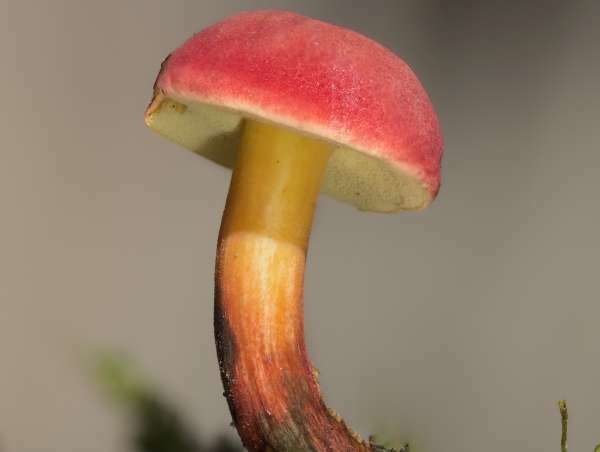 Stems of Hortiboletus rubellus are 4 to 8cm long and 4 to 8mm in diameter, cylindrical; bright yellow at the apex, and progressively more red towards the base. The stem flesh is pale yellow, becoming a deeper yellow low down near the base and turns blue when cut. Subfusiform to subellipsoidal, smooth; 11.5-12.5 x 5-5.5µm. Faint pleasant smell; no significant taste (although some find it slightly soapy). Hortioletus rubellus is an ectomycorrhizal fungus; it is found growing on rich soil beneath trees, notably beech and oak - frequently in parks and gardens. Early July to the end of September in Britain and Ireland. 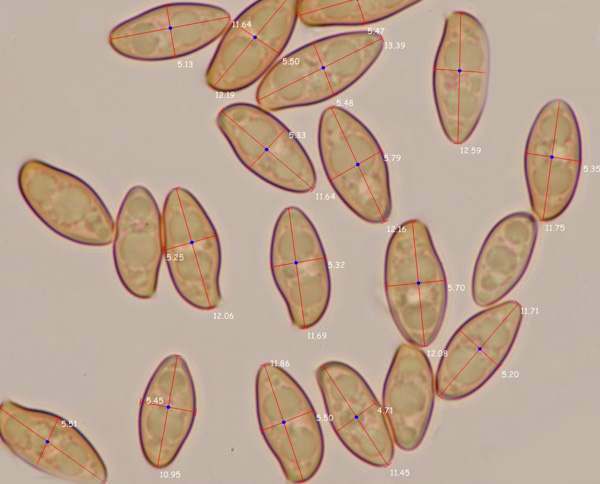 Worldwide, this is one of a complex of similar species that can be separated only by microscopic analysis (and even then determination can be far from certain). 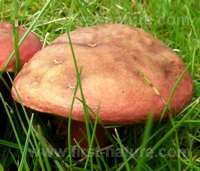 In Britain and on mainland Europe it is most similar to Hortiboletus engelii (which has a much browner cap even when young and fresh) but could also be confused with Rheubarbariboletus armeniacus, a rare species that has a similar reddish cap but lacks the red colouring on the stem. Although some authorities state that they are edible but with a soapy flavour - hardly a recommendation - these little mushrooms are prone to maggot infestation. 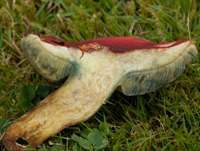 Those are just two good reasons for not gathering Hortiboletus rubellus, and if anyone needs a third then they are quite a rare find in Britain and so the beautiful fruitbodies are surely best left for others to enjoy. This page includes pictures kindly contributed by David Kelly and Joanna McManus.